Much has been said about designer Tom Ford's debut as a director, A Single Man. Many have criticised the former creative director of Gucci for simply turning in a two hour fashion spread that is all style and little substance. A little disingenuous because, whilst there are moments where Ford does allow himself some overindulgence in creating the slick images of the film, he triumphs in visually cocooning what must be one of the most remarkable performances from Colin Firth I've had the pleasure to see. 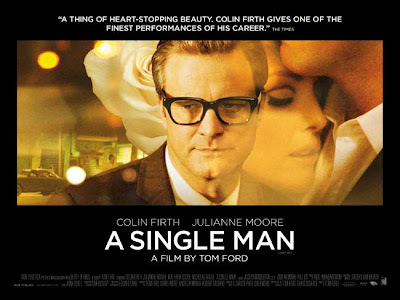 Based on the 1964 novel by Christopher Isherwood, A Single Man examines a day in the life of an ex-pat English Literature lecturer George Falconer. Falconer is still grieving over the loss of his partner of 16 years, Jim, in an horrific car crash and as the grief physically becomes too much to bear, he considers suicide, believing that his life is done and there's no point in hanging around. The film follows him, almost dreamlike, through the events of the day: lecturing on Aldous Huxley to his students, clearing his desk on campus and his safe deposit box at the bank, fighting off the drunken advances of his British girlfriend Charley and encountering student Kenny, who is clearly obsessed with George enough to get his address and follow him to a local bar. As this loose narrative weaves together Ford peppers the film's landscape with a number of hallucinatory visions and searing flashbacks. Here, we see how George first met Jim in a crowded beach side bar; how they shared their lives with Jim envying the dog's life of their terrier; a dreamlike vision of George kissing the dead Jim, which opens the film, as well as bizarre encounters with his neighbour's children. The film's major concerns, and they were Isherwood's too, are about middle age, loneliness and fear of rejection and how life is simply something you can't plan, where your days are at the mercy of fate and the ticking away of time. What Ford also seems to be saying is that no matter how immaculately you design your day to day existence, it's simply a stylish smokescreen to obscure the raw, gnawing anger, self-hatred and self-pity that most of us are cursed by in our moments of weakness. For all the slick, Madison Avenue gorgeousness that Ford bathes the film in, George's material existence rings false when all that George needs is to feel wanted again by another human being. Behind this brittle glamour are a number of interesting cultural observations too. The film is set in 1962 and makes it evident through the use of radio and TV broadcasts that much of the fear beneath the sheen of the Californian sunshine and post 1950s American dream is being driven by the Cuban Missile Crisis and a potential nuclear holocaust just around the corner. A neighbour's paranoia about not having built a nuclear shelter provides a humourous and ironic vision too and George's rant about fear to his students acidly summarises this and other concerns too. 1962 saw a culture on the cusp of huge changes in America where the dying days of the 1950s were giving way to teenage counter-cultural movements, the death of the dream with Kennedy's assassination. Certainly George and Charley emphasise that the reason they came to California was to live the bohemian 'dream'. However, they both feel it is slowly turning sour and hanker notions of returning to London where ironically changes in culture and society were likewise undergoing a massive revolution. Ford's film can therefore be seen as paean to capitalist extravagance, a love of the exquisite materialism of the time (in houses, cars, interior design, clothes, men and women) but it also strongly acknowledges their shallowness in the face of a spiritual beauty, realised both internally by the characters, George, Kenny and Jim particularly, and by the ever changing qualities of natural light, colours, the landscape and the ocean. When Kenny and George go skinny dipping it's a point in the film where George sloughs off the overly designed materialist baggage of his life and his internal crisis and wantonly embraces the raw power of the ocean, the moonlight and the physical qualities of the naked male body. The fact that he nearly drowns perhaps indicates that he isn't quite properly equipped to embrace the spontaneity of 'silliness' or just simply letting your guard down. Likewise there is the roseate hue of a sunset as George picks up James Dean clone Carlos outside a liquor store and the jagged cliffs of Vasquez Rocks used in monochrome flashback to Jim and George sunbathing. George's loneliness and his determination to commit suicide also provides some delightfully black humour too and one gets the feeling that Ford is prepared to mock the visual sheen of his film when George struggles to find a solution to shooting himself that won't leave his brains splattered over the immaculate decor of his Frank Lloyd Wright inspired house. After various attempts at positioning pillows, standing, and then falling over, in the shower it would seem appropriate to zip himself inside a huge sleeping bag in order to do the deed to his elegant satisfaction. There is also much codification of the fear of 'invisible minorities' too. Dramatically it's underlined in the key flashback where George takes a phone call to inform him that his partner is dead and that the family have excluded him from the funeral. The whole trauma is played out on Colin Firth's face with the mask of English reserve crumbling into hot tears and a dizzying dash through the pouring rain to Charley's house. Ford simply lets Firth have control of the scene and lets the camera absorb a deeply moving distillation of emotions. The soundtrack as he montages quick cuts of George falling into Charley's arms, grief stricken, is the rush of the pounding rain. It's incredibly evocative, bristling with controlled rage against the homophobia from Jim's relatives and engulfs us in the primal torture of sorrow. Firth's career best performance is the heart of the film and he manages to avoid plunging it into misery by giving George a typically English irony about his situation. What else could befall him as he plods through his day? He takes it in his stride and the only distractions, the perfect moments he talks about, are those where he is engaged by the smoldering Carlos (a stunningly beautiful debut from model Jon Kortajarena) and Kenny, all fresh face and piercing eyes (a sweet and charming Nicholas Hoult). 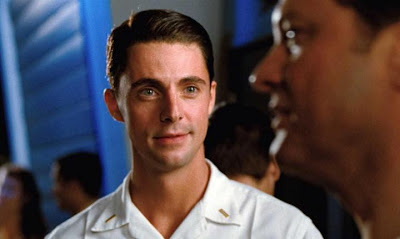 Matthew Goode is also perfectly fine as Jim, in playful and effervescent contrast to the stoic George. The other major performance here is Julianne Moore as Charley, all piled up hair, Dusty Springfield make-up, pink Sobranie cigarettes and Cardin style dresses. The fact that she brings the self-absorbed and self-pitying Charley out from behind this confection is testament to her skill where others less talented might have been suffocated by the characters's outward appearance. Throughout Ford emulates the likes of Hitchcock - patently obvious in the scene between Carlos and George where they are parked in front of a huge billboard advertising Psycho and in the Herrmann-esque strings of the soundtrack score that echo the equally obsessive tone of Vertigo - and the pulsating sexual tensions and clipped close-up iconography of faces and objects belonging to Almodovar. There is also a deft handling of colour in the movie with it reflecting George's internal feelings as the day progresses in moments where he affirms life then bursting into more saturated hues whilst the rest tends towards the bluer and greyer. As he talks to a colleague, briefly two bare chested young men play tennis and the screen is filled with close ups of their glowing, tanned bodies gleaming with sweat, symbols of George's desire, before the scene quickly drags us and George back into silvery conformity. Some seem to have found the film depressing but it's quite the reverse. 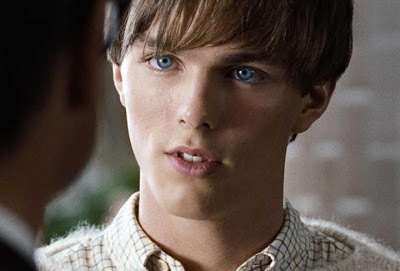 The message of the film, that life's riches aren't necessarily found in blatant materialism, is summarised in the conversation between the sexually ambiguous Kenny and the older George in the beach side bar where they discuss the present and the future. George believes 'Death is the future' and that if you're not enjoying the present then there's not a lot to suggest that it'll get any better in the future. Kenny simply says 'the thing is, you just never know' and to illustrate he says, 'Just look at tonight' as an instance where George could never have known that Kenny would walk into his life. However, just as George sees a glimpse of those riches, fate has one more irony up its sleeve for him. Unmissable. Firth is amazing and there are rich, deep themes beneath the slick surface of Ford's immaculate vision.